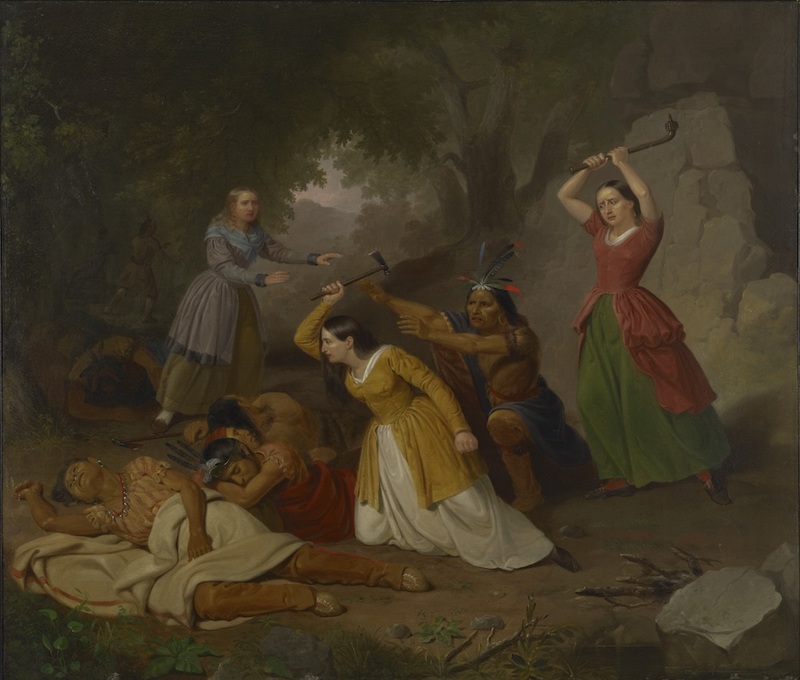 Junius Brutus Stearns, “Hannah Duston Killing the Indians” (1847). Oil on canvas. Courtesy of Colby College Museum of Art, Gift of R. Chase Lasbury and Sally Nan Lasbury. This statue of Hannah Duston was the second one erected in Haverhill, Massachusetts. 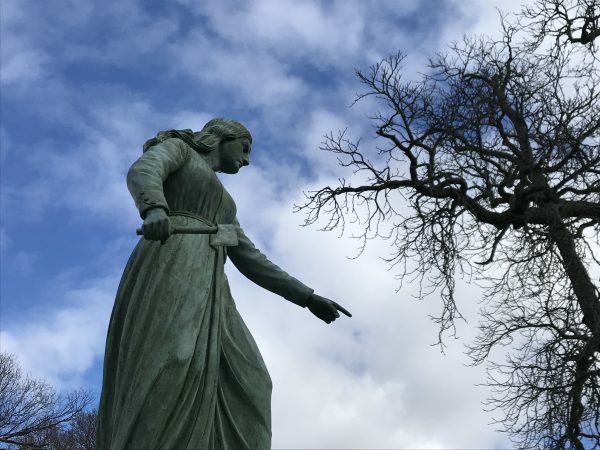 In other statues she holds scalps, but here she points her finger accusingly. Photo courtesy of Gregory Rodriguez. Hannah Duston never wrote down her story. Most of what we know about her comes from the influential Puritan minister Cotton Mather, who published three versions of her tale between 1697 and 1702, embedded in his larger works on New England history. Mather frequently portrayed Indian people as instruments used by the devil to thwart the Puritan mission. He described Duston as a righteous ringleader who had every reason to convince the other captives to act. He stressed the “savagery” of her Indian captors, providing a horrific description of the murder of her child (“they dash’d out the Brains of the Infant, against a Tree.”). We will never know the full truth of Duston’s ordeal—was her baby murdered or did it die?—but Mather’s version of the death highlighted Indian violence to justify Duston’s gruesome vengeance. Mather asserted that Duston and Neff never meant to kill the small boy who escaped; he was “designedly spared” so they could bring him home with them, if he hadn’t run away. At the same time, Mather was apparently unconcerned that six of the “wretches” the captives scalped were children. He compared Duston to the biblical heroine Jael, who saved her people by driving a spike through Sisera’s head while he slept. Cotton Mather understood the wars between New England Puritans and Indians as battles between good and evil and this clearly shaped the way he told Duston’s story. She was a heroine saving her people from “savage” outsiders, fighting a justified war. After 1702, Americans forgot about Hannah Duston until the 1820s, when there was a half-century-long revival of interest in her story, stoked by the nation’s expansion westward into Indian lands. The nation’s foremost literary figures, including Nathaniel Hawthorne, Henry David Thoreau, and John Greenleaf Whittier, all wrote about her. Virtually all histories of the United States from that time contained a version of the story, as did numerous magazines, children’s books, biographies of famous Americans, and guidebooks. A mountain in northern New Hampshire was named “Mt. Dustan” in her honor—and of course, communities erected the three monuments. It is no coincidence that Americans renewed their interest in the Duston story during this time. From the 1820s, when Georgia began pressing for the forced removal of native people, through the Battle of Wounded Knee in 1890, the so-called “Indian problem” was almost always in the news. 19th-century white Americans were well aware of the moral issues that Indian removal raised, and engaged in heated national debates. As an 1829 “Circular: Addressed to Benevolent Ladies of the United States” put it, “The present crisis in the affairs of Indian Nations in the United States, demands the immediate and interested attention of all who make any claims to benevolence or humanity.” The circular described Indians as “free and noble” yet “helpless,” and “prey of the avaricious and the unprincipled” who wanted to steal their land, not caring that Indians would “perish” if removed. Women, excluded from formal politics at this time, were active in the anti-removal campaign. They justified their involvement in a political issue by framing Indian removal as a moral question. 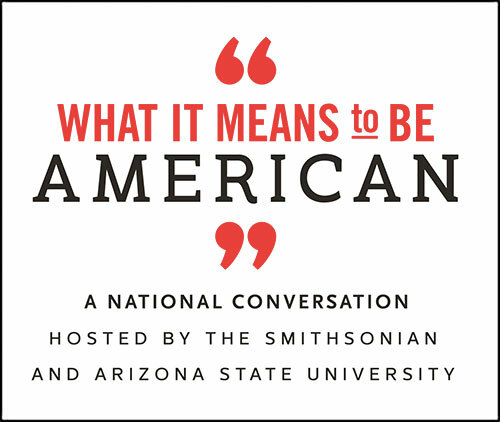 In the 1820s, virtue was central to American national identity, and embodied in women. This is why Columbia became such a popular symbol of the nation—and why some turned to the story of Hannah Duston as ammunition in the debate over Indian removal. How could a virtuous democratic nation evict Native Americans from their homelands, and wage war against them when they refused to give up those lands? It was possible only if those Indians were “bloodthirsty savages” who attacked innocent white Americans. Because female virtue was linked to the nation’s virtue, what violent act could be more innocent than that of a grief-stricken mother who had just witnessed the murder of her newborn child? The idea of a feminized, always-innocent America has become the principle by which the United States has structured many interactions with enemy others. But one problem remained: How could an “innocent” wronged mother murder someone else’s children herself? Tellingly, the fact that the “innocent” Duston killed six children was increasingly erased from accounts of her actions from the 1830s on. She thus became an American heroine. Efforts to commemorate Duston began in earnest with the acceleration of western expansion in the 1850s. The first monument, built in Haverhill in 1861, was a marble column. On its base was a shield, surrounded by a musket, bow, arrows, tomahawk, and scalping knife. Engravings on its sides told the story of the “barbarous” murder of Duston’s baby and her “remarkable exploit;” the column was topped by an eagle, symbol of the American nation. The monument’s builders, however, never fully paid for it, and in August 1865 it was stripped and resold to another town as a Civil War memorial. As long as the so-called “Indian problem” continued, Duston remained an important historical figure, her story presented as moral justification for American expansionism onto Indian lands and into Mexico. But by 1890 officials had pronounced the “frontier” closed. The Indian population had reached a historic low, and the U.S. government confined virtually all Natives who remained in the West to reservations; the “Indian problem” was over. The nation reassessed its attitudes toward Native Americans, and public interest in Duston’s story plummeted correspondingly. The tale disappeared from textbooks and popular culture. Still, the powerful dynamic the story helped to establish remains with us today. The idea of a feminized, always-innocent America has become the principle by which the United States has structured many interactions with enemy others. In international wars as on frontiers past, it has portrayed itself as the righteous, innocent, mother-goddess-of-liberty patriotically defending herself against its “savage” enemies. Barbara Cutter is an Associate Professor of History at the University of Northern Iowa. She is the author of Domestic Devils, Battlefield Angels: The Radicalism of American Womanhood, 1830-1865.